Recently, I’ve been doing a lot of selfless sewing. Luke has started showing more interest in what he wears, and as a result, is very keen on having an entirely handmade wardrobe. Somewhat surprisingly, I’ve really been enjoying the process of making him clothes – talking about his colour palette (I’m not even joking, he’s made himself a colour palette), picking out fabrics, talking style details and selecting patterns. 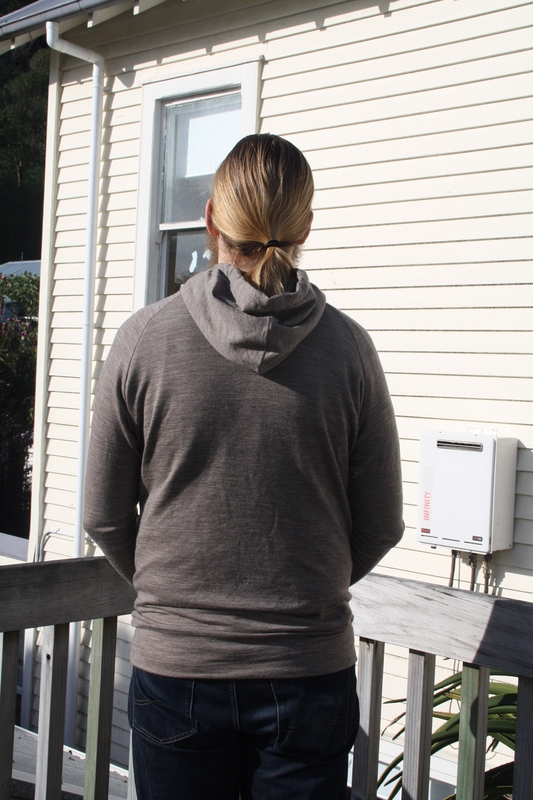 This is my latest make for him, an oatmeal merino hoodie from the Papercut Patterns Undercover Hood pattern. You may be wondering why I chose to use a pattern designed for women to make a hoodie for a man. The main answer would be, because I’m cheap. I also want to make a hoodie for myself, and I figured that the Undercover Hood is a fairly boxy pattern and could suit us both. 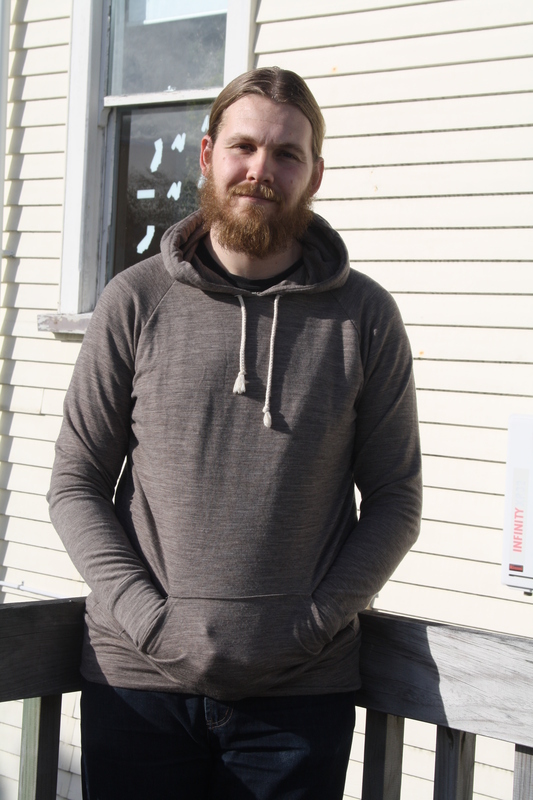 Also, at the time I didn’t think there were many other men’s hoodies patterns out there (forgetting, of course, about the Finlayson Sweater from Thread Theory). At any rate, I’d already bought the Papercut pattern on advice from Sandra at a recent sewing meetup, so I forged ahead. I cut out a size L, based on Luke’s measurements, and lengthened the sleeves and body accordingly as Luke is 6’4″. 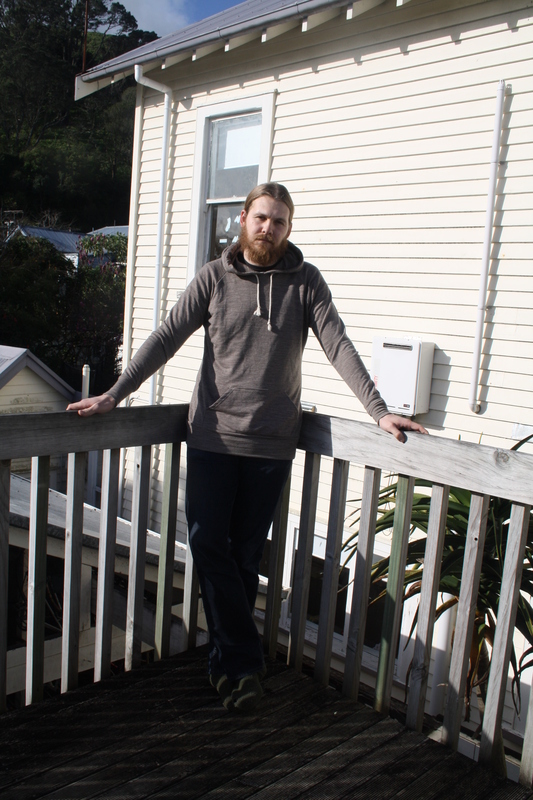 There was some to-and-fro about whether Luke wanted the hoodie version or the neckband version – I ended up cutting both out as he couldn’t decide, but in the end he went with the hood and I think it was a good choice. The hoodie was the most fun part for me – I went with eyelets, rather than buttonholes, for the drawstring – all the RTW hoodies I’ve ever owned have had eyelets and besides, I hate making buttonholes. I got them from Geoff’s (where else?) along with the rope cord for the drawstring. 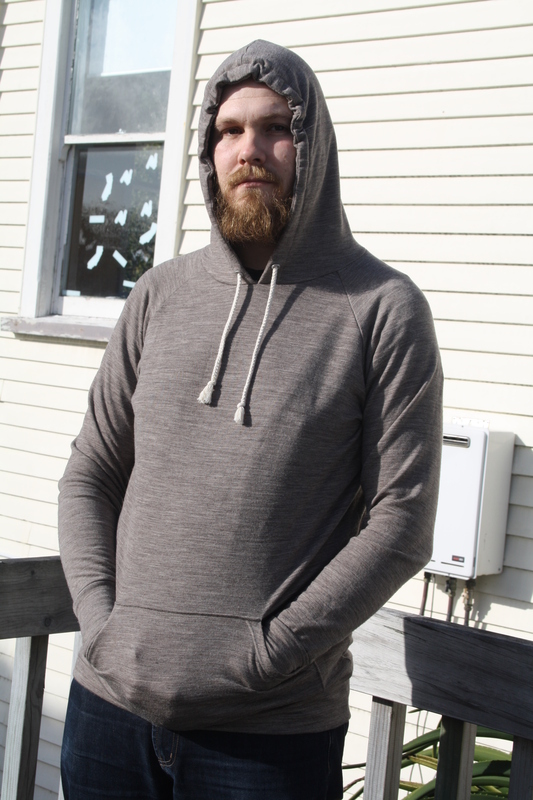 The fabric for the hoodie came from Trademe and is a sweatshirting weight, with looped terry on the wrong side. It’s snuggly warm! I’m so proud of my stitching on this hoodie – I used a triple stretch stitch for most of it, including the topstitching on the pouch pocket. 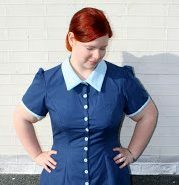 I was terrified of sewing that on, but I fused knit stay tape onto all the edges beforehand, and used my walking foot and the stretch stitch and it worked perfectly – no waviness at all! I twin needled the open edges. I sewed all the other seams with the triple stretch stitch so they’re nice and sturdy and durable. 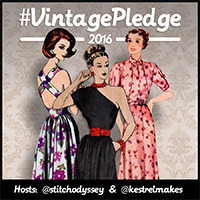 I overlocked the raglan seams, but my overlocker has serious issues so I quit while I was ahead for fear of ruining any further seams. As for the fit – I think it’s okay. I mean, it wasn’t designed with a guy in mind, but I think hoodies are not exactly fitted garments, so it’s fine. Luke really likes it, and has been wearing it a whole lot since I finished it a week ago. His only complaint is that the sleeve cuffs are a bit snug, and I figured out why just recently – when I was packing up the pattern pieces and cutting them down to an M for me, I realised the cuffs had been cut to an M already! So no wonder it’s a little hard for Luke to get his giant man hands through them. Oops. He says they’re already stretching out a bit though, so that’s good. Otherwise it’s all good – there seems to be *something* going on with the armpit/upper bicep area with the sleeves, but I don’t know what – there’s a fair bit of wrinkling there. I don’t know enough about men’s clothing to know what the deal is, or how to fix it, but Luke is comfy in it so that’s all that matters! → International fabric shopping recommendations, come at me! Nice job, and how cool that your guy is interested in his clothing! It looks a little snug in the arms and shoulders as well as the hood. Maybe just size up to an XL? Thanks Annie 🙂 He’s pretty happy with the hood, but I think I will try sizing up to an XL next time. I think you’re right, it is a bit snug in the arms than it should be. What a great sweater! If I’ll show that one to Marvin I think I’ll have to make him the same one too. I just recently finished a Hoodia with zipper for him and surprisingly for me too I had a lot of fun too! And how great is that that Luke is so into his wardrobe!